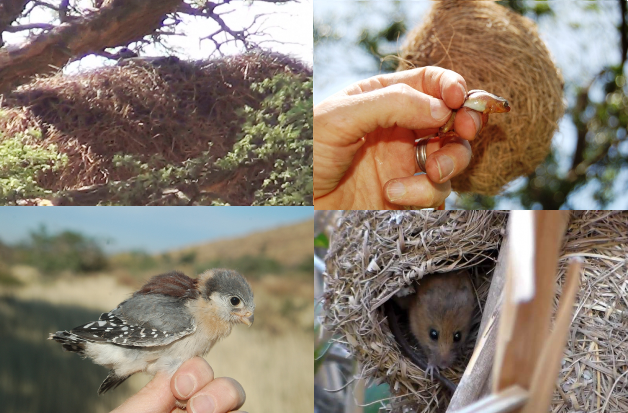 A recent paper in Biodiversity Observations titled "Birds and animals using weavers nests" summarises an interesting part of PHOWN (PHOtos of Weaver Nests), a project in the ADU Virtual Museum. Weaver nests are sometimes used for breeding or roosting (or shelter) by a variety of birds, and even other animals. A total of 383 PHOWN records, out of 25000, show examples of squatting (for breeding or roosting) in weaver nests by creatures that did not build the nest. Thanks to all the citizen scientists who contribute to the Virtual Museum, and in particular to those who contributed to this study. Read the paper at pdf, where you can download a pdf of the paper. Brant's Climbing Mouse in a Cape Weaver nest.